Everybody is aware of the bustle of getting ready for Christmas, and most people, particularly parents, breathe a sigh of relief once the festivities are over. Its time to put the feet up, rest and enjoy some Christmas TV, or sleep. Once the relatives and friends are out of the door, the remains of the turkey have been picked clean, and the washing up done, what about the huge pile of waste that is left to dispose of? Economically, Christmas is the most important time of the year for retailers, which is why Christmas nowadays seems to start in early November. People start thinking about presents, food and drink and sending Christmas cards, as well as buying and decorating a tree. Christmas is a bad time though for the environment, because so much more packaging and waste materials get produced, which ultimately get thrown into waste disposal sites, or incinerated, or worse, dumped.It is crucial that this year, consumers pay equal attention to the environment and that everyone plays their part in reducing waste. The first step with packaging is for the conscientious consumer to try and buy less of it. Most types of packaging can be recycled, but if less can be used in the first place, the battle against it can be one. Use consumer power and ask manufacturers and retail outlets to use less of it. Some consumers now refuse packaging in store, and expect supermarkets and electrical stores to deal with the waste surrounding the product they buy. After Christmas, separate wrapping paper, cardboard from presents, envelopes from Christmas cards, and newspapers and magazines, and take them to the local recycling depot. Many Councils across the UK now operate kerbside recycling schemes, providing householders with special collection boxes, usually either black or blue, for separated recyclables.There are likely to be extra collections after the Christmas period, for Councils to be able to deal with all the extra material thrown out. Again, as with packaging, these materials can easily be separated and recycled. Many schemes exist after Christmas for the exclusive collection and recycling of Christmas cards. Money raised from the recycling and sale of the recycled material is often collected by charities. Look out for these boxes, which often appear at supermarkets and bigger local stores just after the Christmas period, and recycle for a good cause. If all the Christmas imbibing has produced a rather large hangover, at least glass and can recycling isn't a big headache. Save all the wine, whiskey and gin bottles for the glass-recycling container, and keep all the tins and cans to go into their specific box. Remember that cans from tinned food, such as tinned tomatoes, baked beans and others, can all be cleaned and recycled too. While peeling the potatoes and topping and tailing the sprouts ready for the Christmas dinner, don't forget that all the raw scraps can be saved and composted, to give your garden or flower boxes a New Year treat. Look at the page on this website about composting, and make the construction of a compost bin a priority on the list of New Year jobs! Bringing a tree into the home, decorating it and piling all the presents underneath, symbolises the best of the festive season.But don't forget that Christmas trees can and should be recycled too. 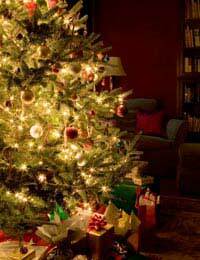 Options include buying a fake tree, which can be used for many years,Or buying a living tree with roots in a pot. This can be planted in a garden soon after the holiday has finished, and looked after and enjoyed outside for as a great addition. Finally, many councils and community groups offer a shredding service for Christmas trees once the season finishes. This turns them into bark mulch and compost to nurture the soil.